The first issue of the journal for 2018 is pleasing for two reasons. First of all, we have managed to squeeze in a little more copy and include seven research articles in this issue along with the usual array of book reviews. Secondly, we have been able to include a number of shorter contributions, something that helps us ensure a broader scope of papers. We open issue 62/1 with an in-depth exploration of a migration-period grave from Sande in Norway. This discovery, explored here by Marianne Vedeler, Siv Kristoffersen and Ingunn Røstad, is remarkable both for its richness in terms of the assemblage and for its surviving mineralised textile remains. Using this evidence the authors explore the funerary dress code of the woman buried at Sande, the manufacture and antiquity of some of the fittings, and how such a costume display may have operated in life and death in terms of local to supra-regional audiences. We stay with early medieval burial for the second article: an open access publication by Rob Collins and Sam Turner, that deals with some important metal-detected finds in Northumberland. The Eslington sword was discovered along with other metal artefacts in Whittingham, close to what was eventually, through excavation, revealed to be a natural mound or knoll used for burial in the Bronze Age. The pattern-welded sword was accompanied by a scatter of material including a glass inlaid shield mount and brooch fragments. These seem likely to derive from a late 6th-/7th-century cemetery and high-status male grave, and in this respect mark one of the most northerly indications of this kind of elite male burial. The context is suggested to be the territorialising processes that led to the creation of the large Northumbrian kingdom. 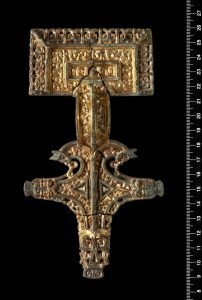 Our Martyn Jope Award-winning paper this year also has an early medieval focus, but this article tracks an object and its biography, starting with its manufacture in the insular world and its eventual discovery in Scandinavia. In line with the remit of the award, this paper by Aina Heen-Pettersen and Griffin Murray, involves a close analytical reassessment of the well-known reliquary, the Melhus Shrine, and provides a new and novel interpretation of its life-course, from creation to modification and eventual deposition in a 9th-century woman’s grave in Norway. 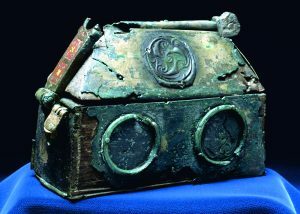 The shrine, a Christian object, is argued to have been reconceptualised, perhaps as a result of the meaning, it accrued as spoil from some of the earliest voyages across the North Sea. Staying with the Christian west, we move next to spatial considerations and landscapes ina theoretically-rich contribution from Ryan Lash on the taskscape of medieval devotion on Inishark Island. Pilgrimage practices are investigated here in relation to early medieval and medieval ritual foci across the island. Depositional rituals involving water-worn quartz pebbles, attested over the longue durée, are investigated and argued to reflect ideas connected to peregrinatio. The next contribution by Aleks Pluskowski is a review paper that captures and interrogates the current state of research on the archaeology of the military orders. The sheer impact of the military orders in terms of urbanisation, rural development and trade is expertly charted, as well as the materiality of the orders in terms of signalling ideology and authority. Ultimately the author sets out a new vision for a holistic and interregional study that will significantly move the subject forward. The great relief brooch from Sande. Scale in cm. Photograph by Ellen C Holte. © Museum of Cultural History, University of Oslo. A substantial reviews section follows co-ordinated and prepared by Professor Neil Christie from the University of Leicester. Beginning with a comparative review of two recent major ‘sea/ocean’ related publications the section moves on to offer detailed commentaries on recent seminal monographs, edited volumes and major site publications. From fortified settlements and maritime settlements to insular sculpture and Scottish silver; reviews chart a diverse and wide-ranging collection of recent publications. Two medieval and late-medieval papers follow that are both shorter contributions. William Wyeth explores the limited traces for medieval timber motte towers: the timber structures that often pre-dated the well-researched, stone-built military/elite structures of the medieval era. Using illustrative and textual sources, the author demonstrates that these were by no means temporary, but were substantial and multi-functional, invested with meaning and status equivalent to their stone counterparts. A summary of recent excavation results from Kincardine Park, Aberdeenshire, follows. While medieval hunting parks have been the focus of study for some time, a fieldwork/research focus has only occasionally been extended to the medieval castles of Scotland. This is redressed here by Kevin Malloy and Derek Hall who put forward evidence and arguments for Kincardine, for the establishment and development of the hunting park over time, and the cultural significance of this monumentalised space in the medieval era. I hope that readers enjoy this June issue, now available online and shortly to reach members in hard copy format. Issue 62/1 is my penultimate for the journal. The transition from Maney Publishing to Taylor & Francis has had its moments, but we all hope that production and delivery are now on a more even course. We do, however, rely on our members to let us know if things are not working as well as they might in terms of subscription, membership and receipt of the journal and newsletter. If you have encountered any problems in 2018, then do contact me and I will do my best to resolve them.